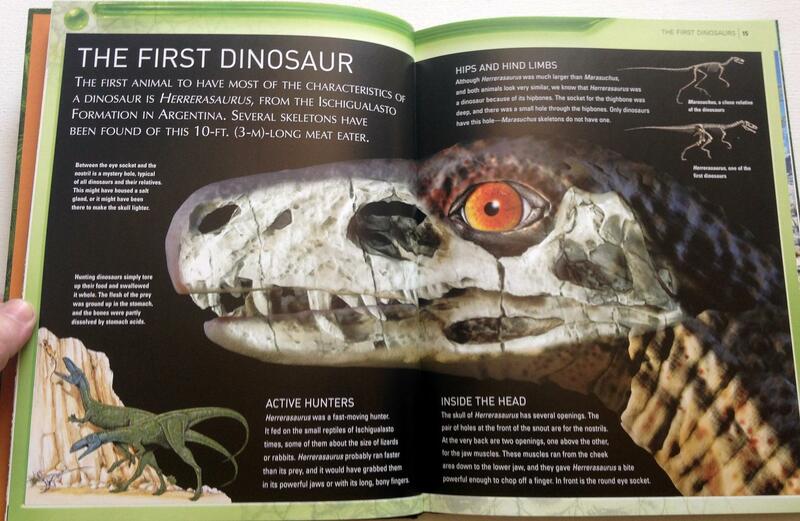 T. Rex Generations stars four young rexes we meet under the watchful eyes of their parents as they hatch from eggs. 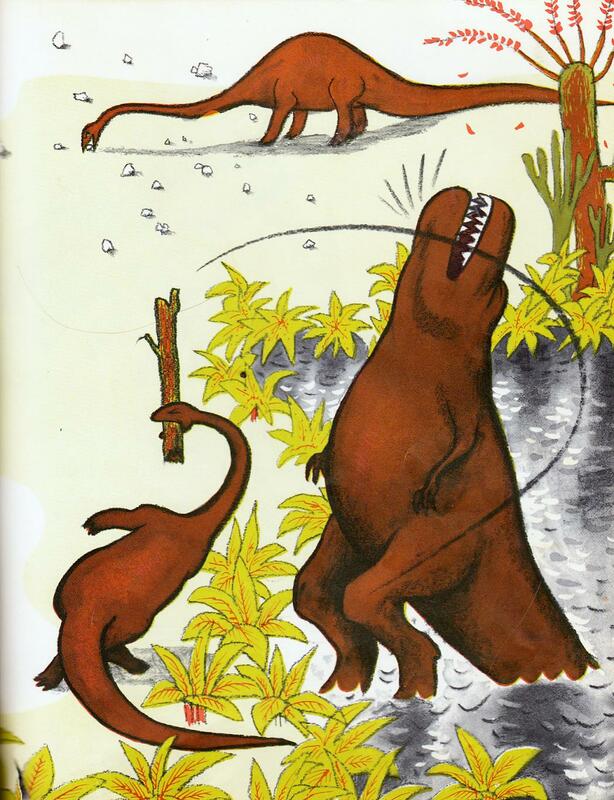 In their youth, the rexes learn to survive, scavenge, and hunt. 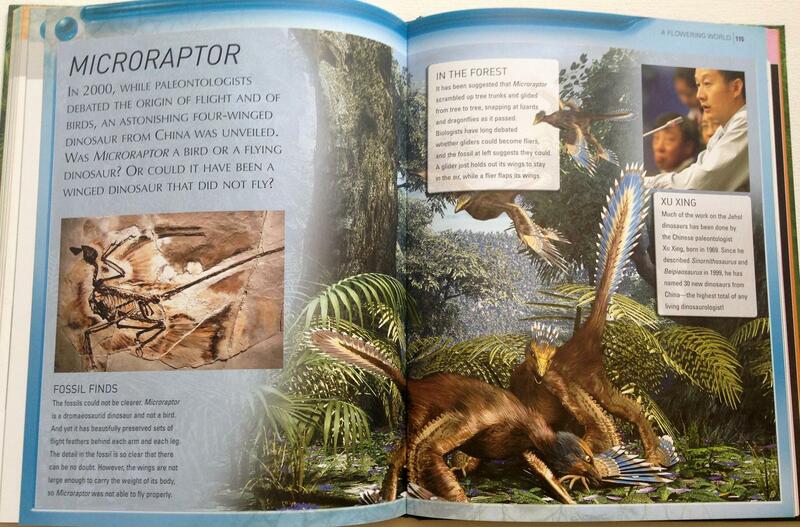 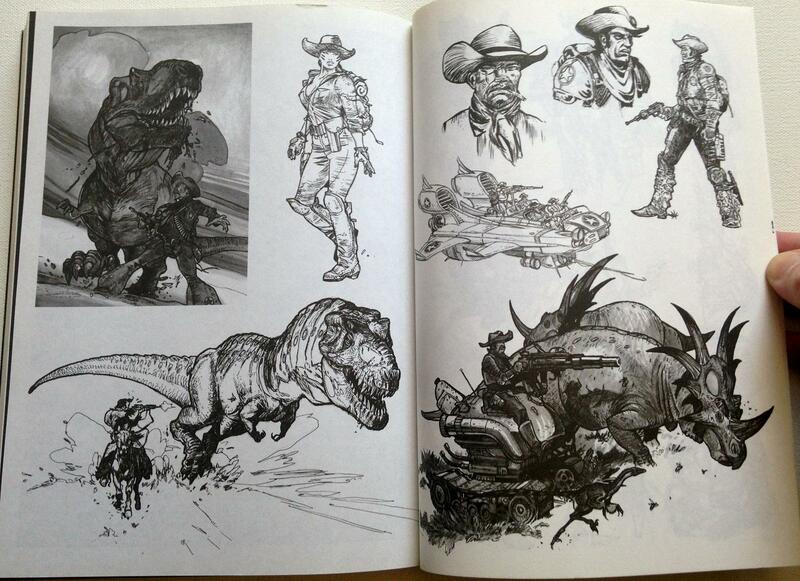 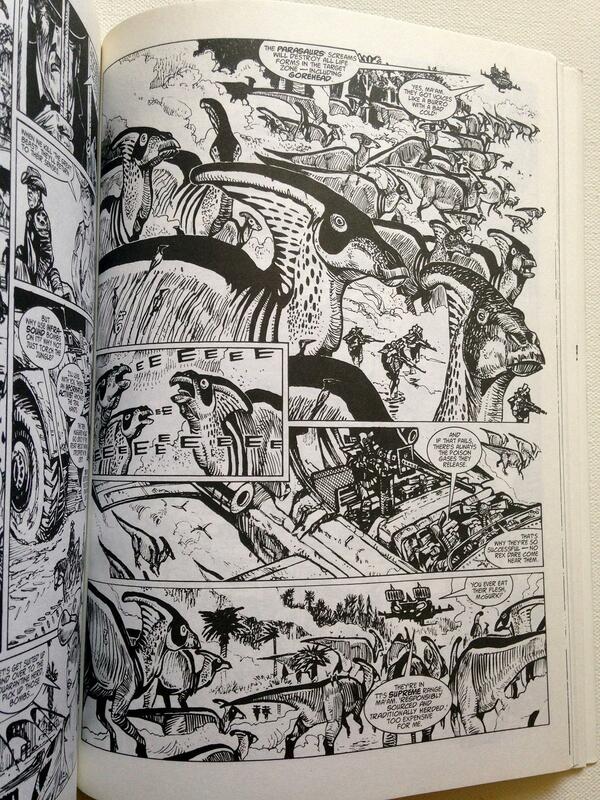 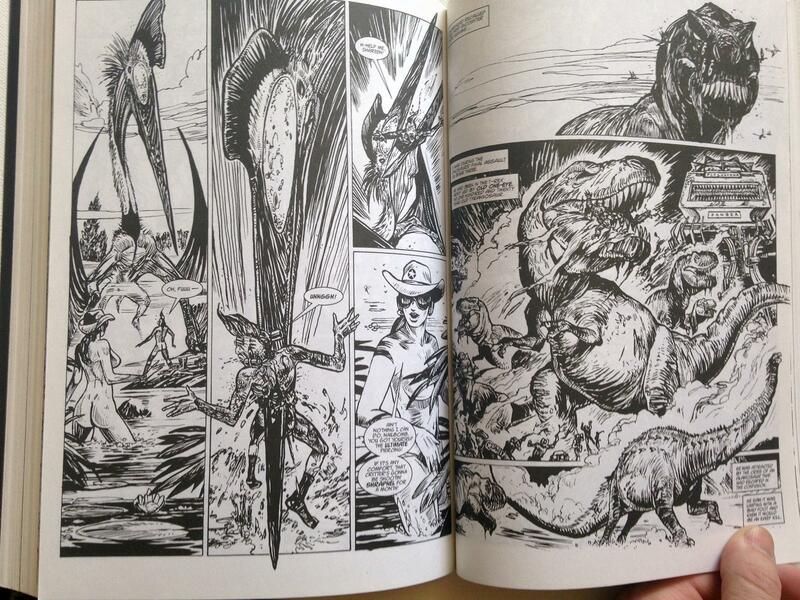 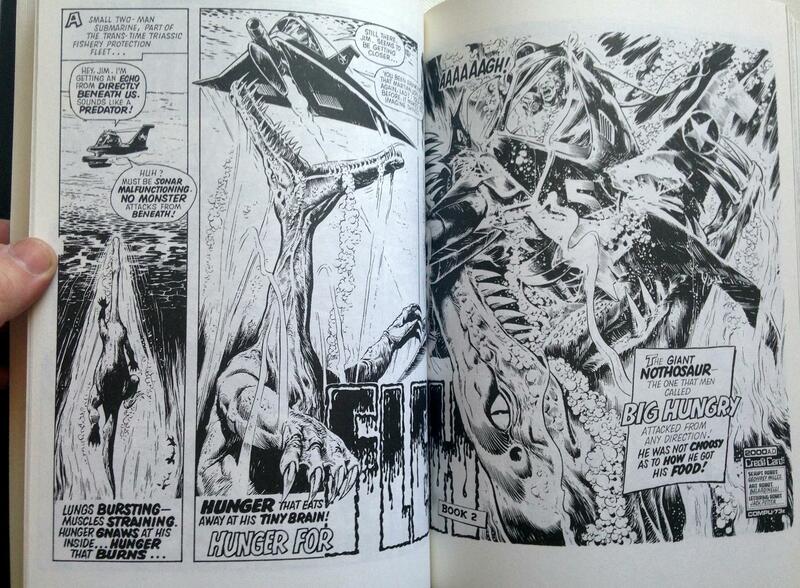 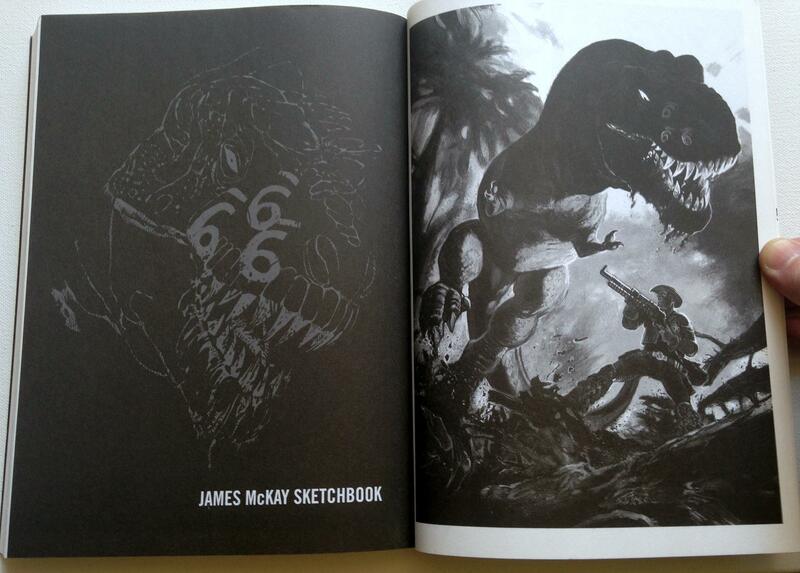 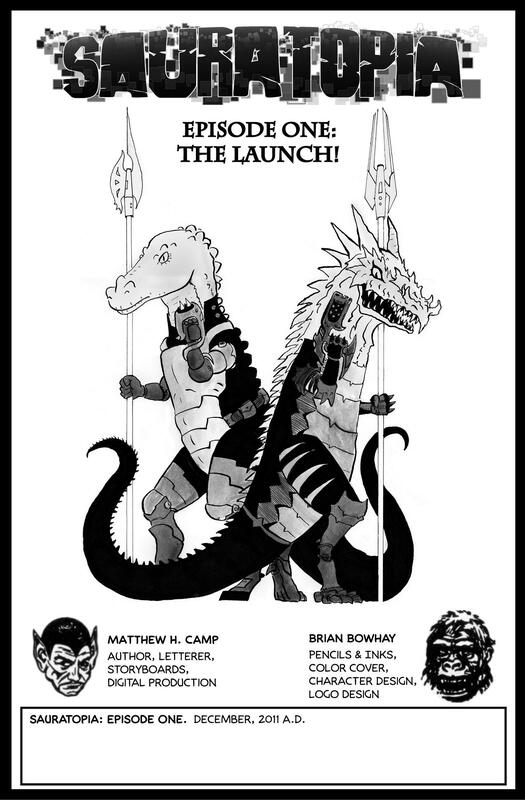 They meet a beautifully illustrated assortment of cretaceous creatures they must battle or escape. 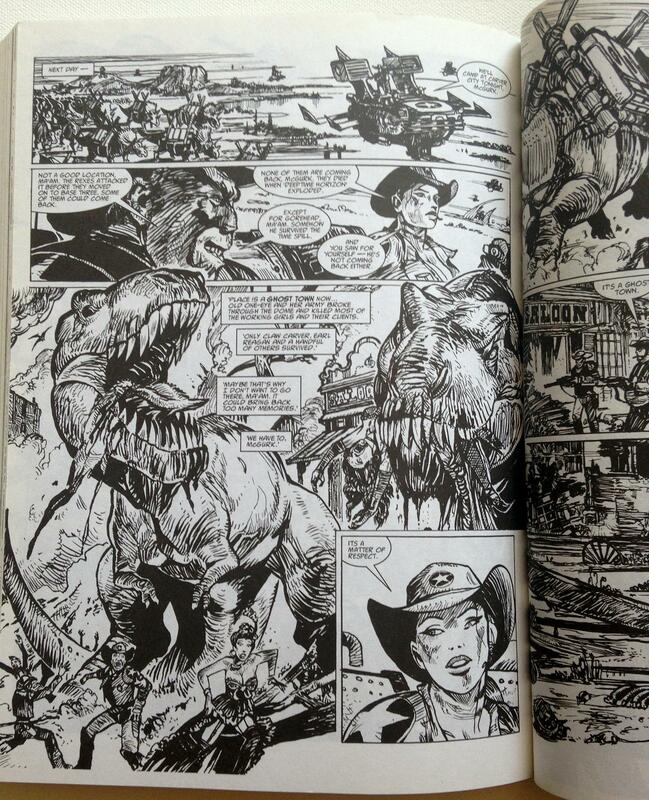 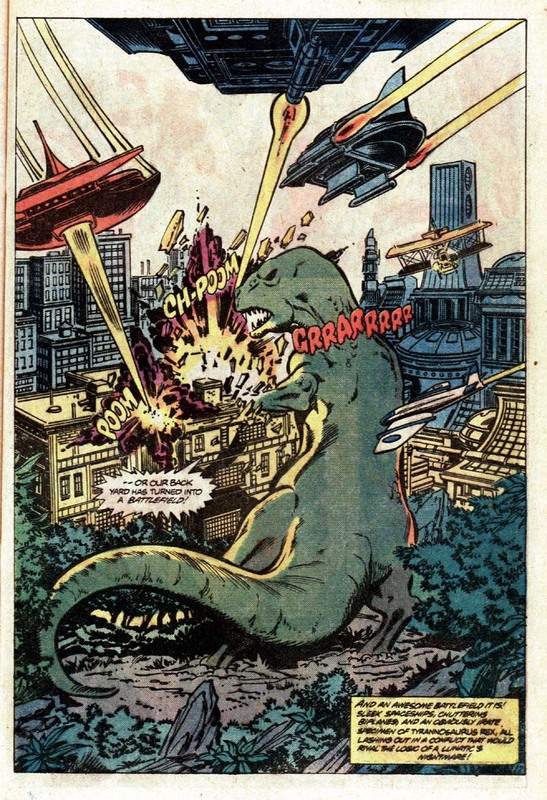 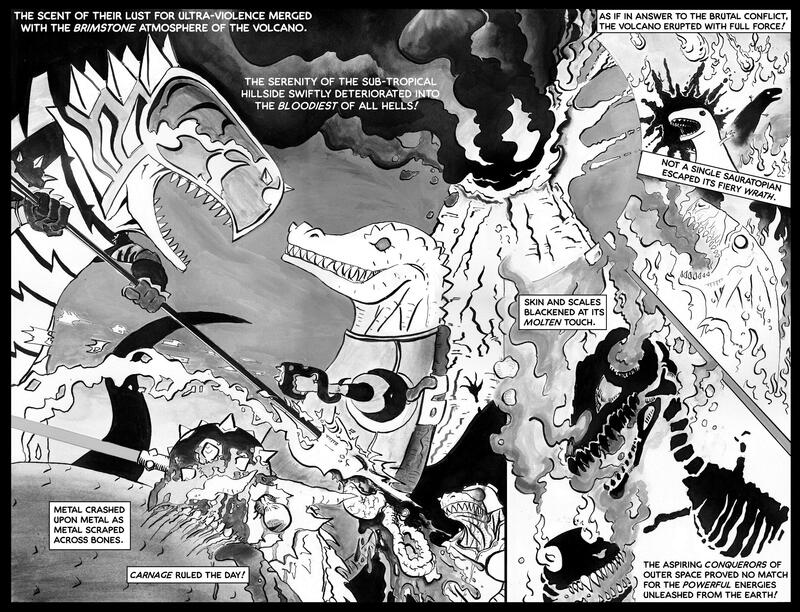 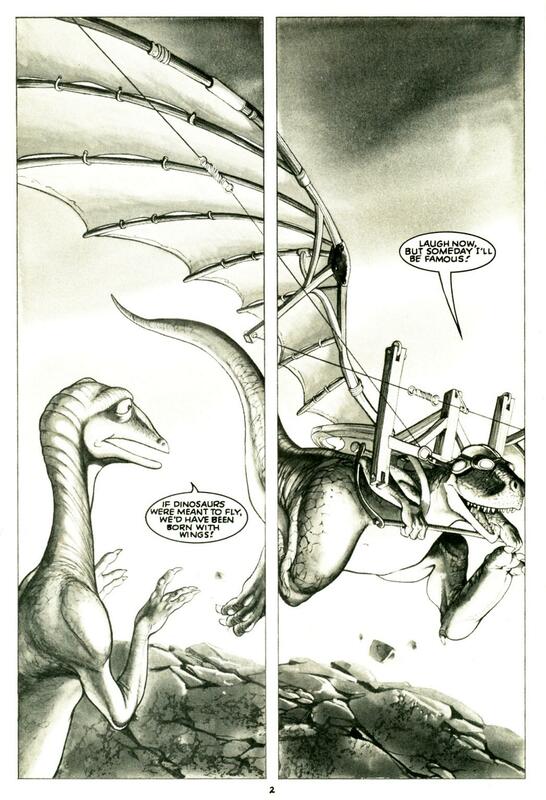 Author and artist Ted Rechlin creates even more dramatic page and panel layouts than in his 2017 brontosaurus book, which makes for great fight scenes. 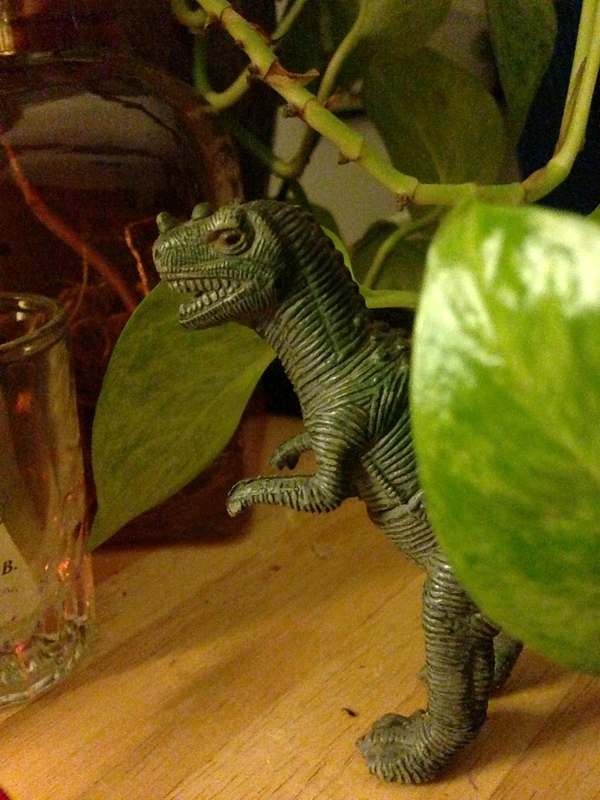 And in a world of monsters just as fierce as they are, not every rex will survive. 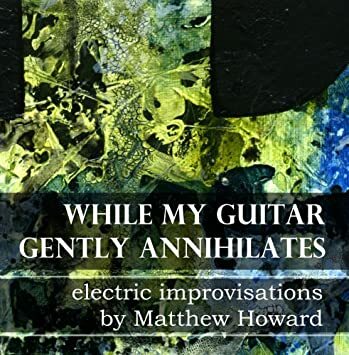 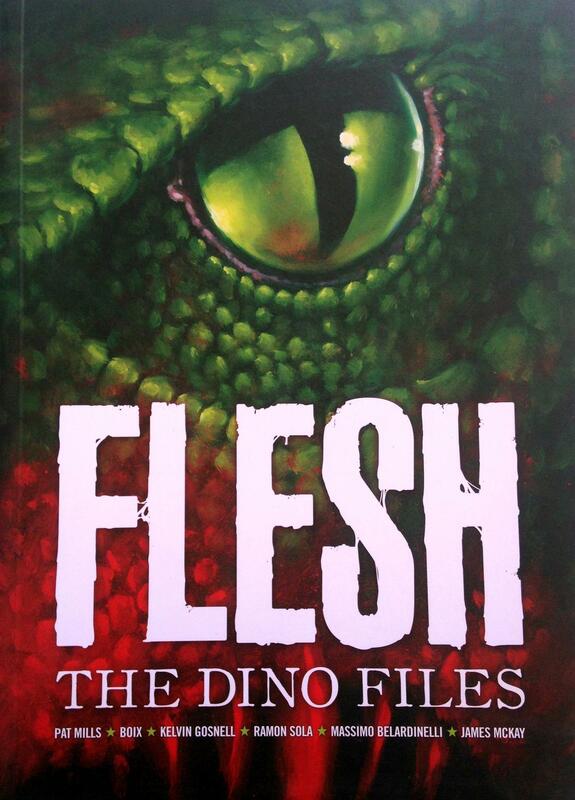 This book will delight dinosaur enthusiasts and comic book fans, and though it has a lot of physical conflict, it isn’t graphic or gory. 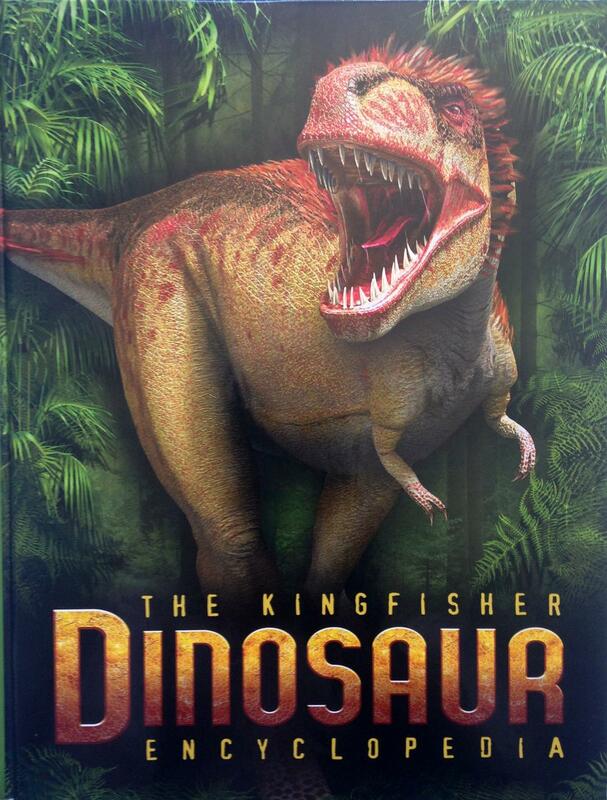 Adults and kids can enjoy this all-ages action-packed story together. 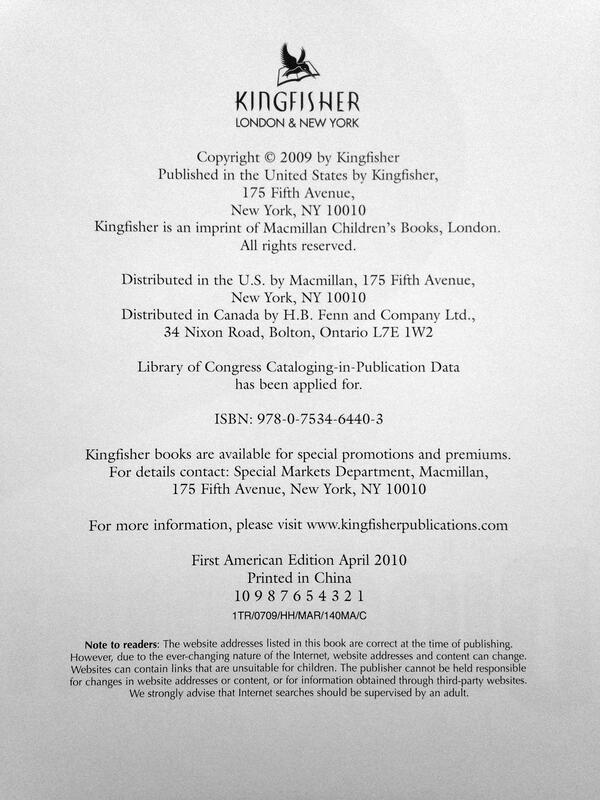 My dislikes are mostly minor details: seeing the same double-splash page of empty landscape repeated where more story pages would be welcome; anachronistic phrases such as “so the siblings ease off the gas” that seem out of place millions of years before cars; and a couple spots of clunky exposition such as saying “as was previously noted…” when repeating something from a few pages prior. 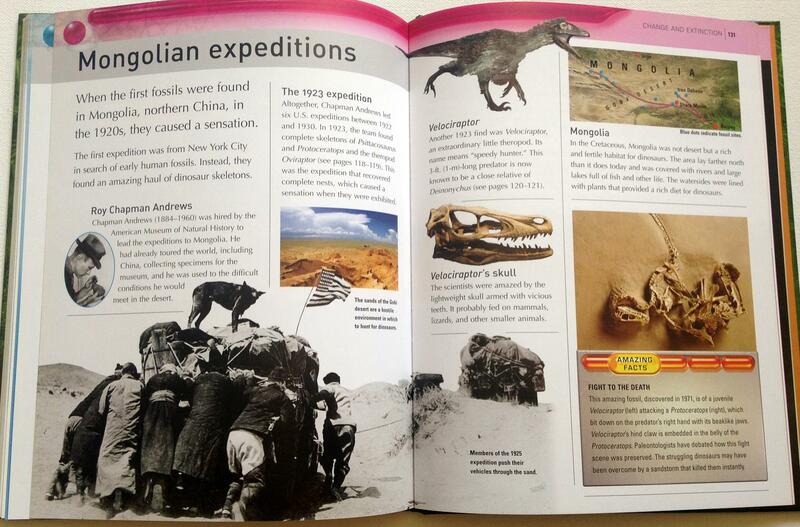 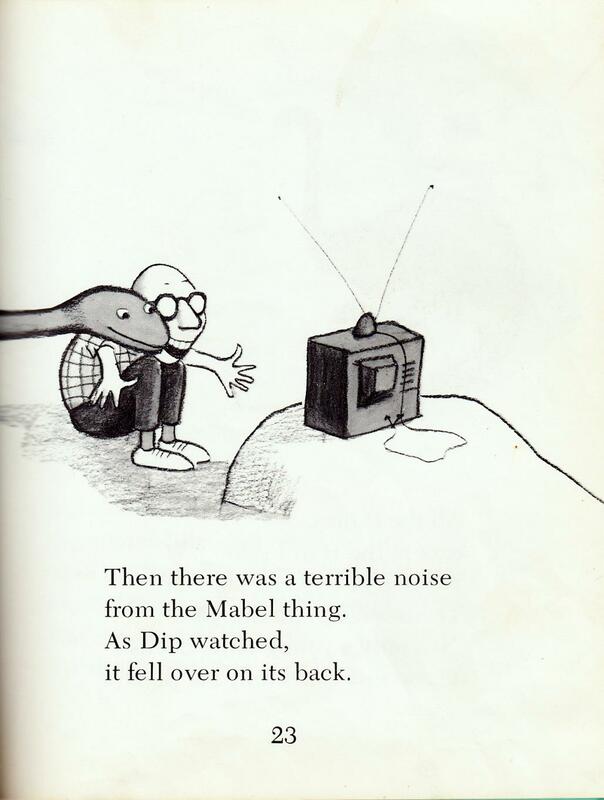 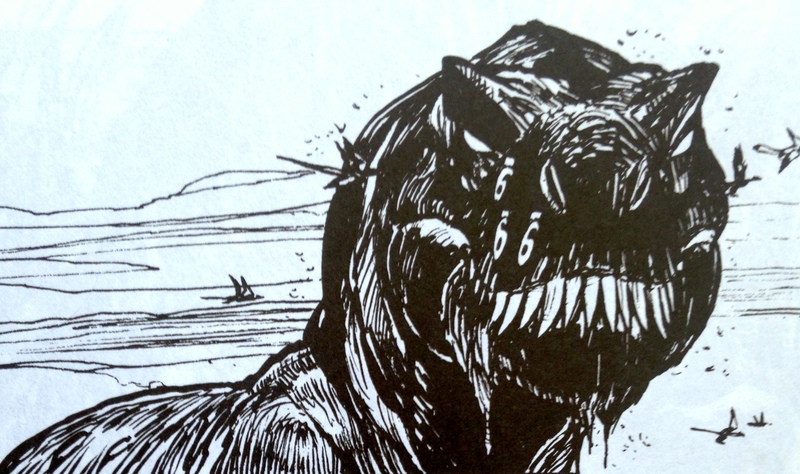 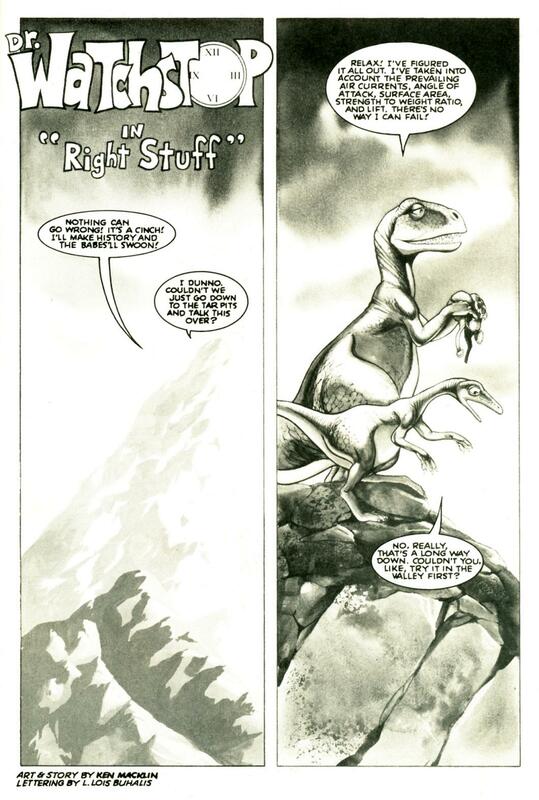 My only major concern: why do the young rexes not get named until the final page? 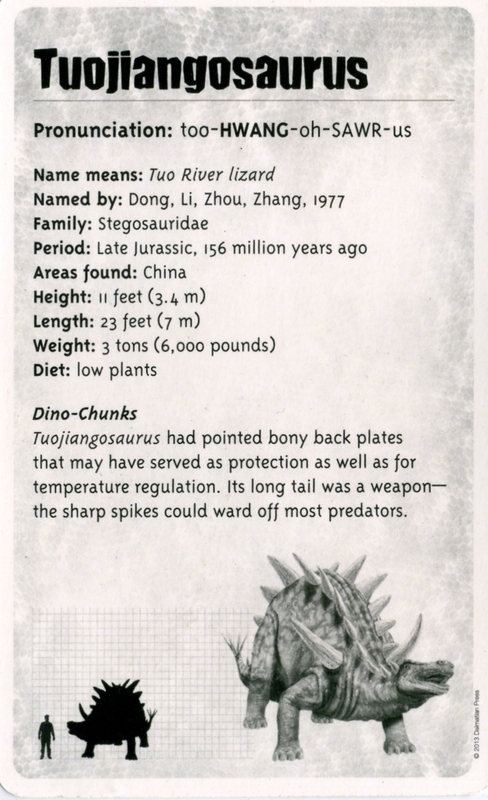 Characters we care about in a story usually get identified by name right away, and the parent rexes are identified just after the babies hatch. 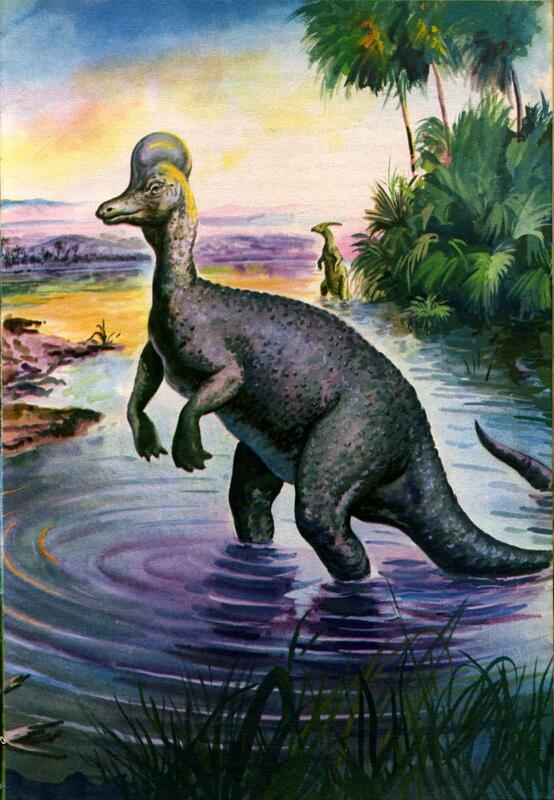 It isn’t clear why the younger rexes don’t get names until late in their adolescence, unless we see their climactic edmontosaurus kill as a rite of passage into adulthood. 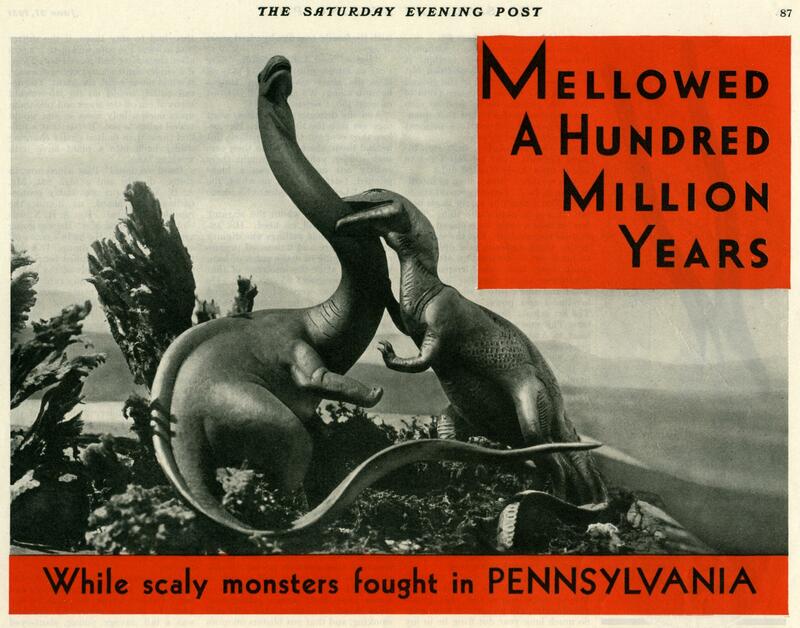 But even though a caption describes that as a “first kill”, it seems more likely that a predatory reptile who has been larger than a pickup truck for years has killed more than a few things. 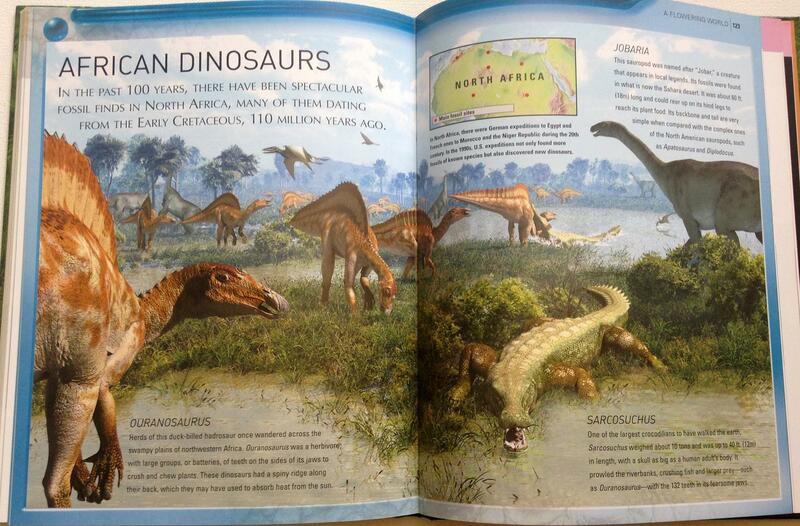 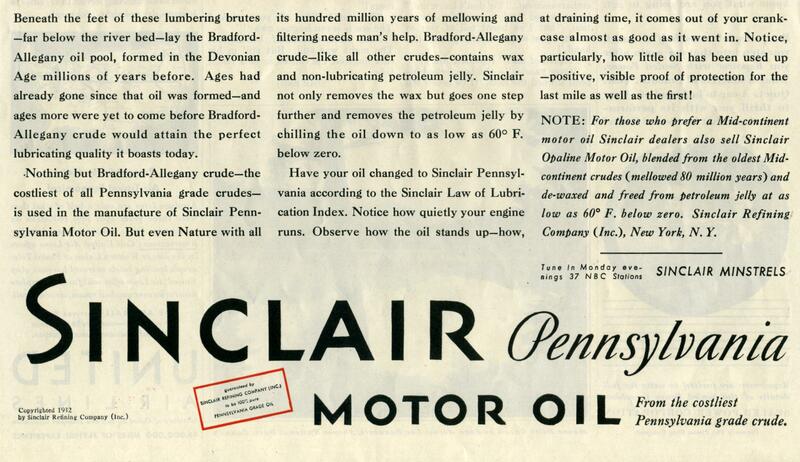 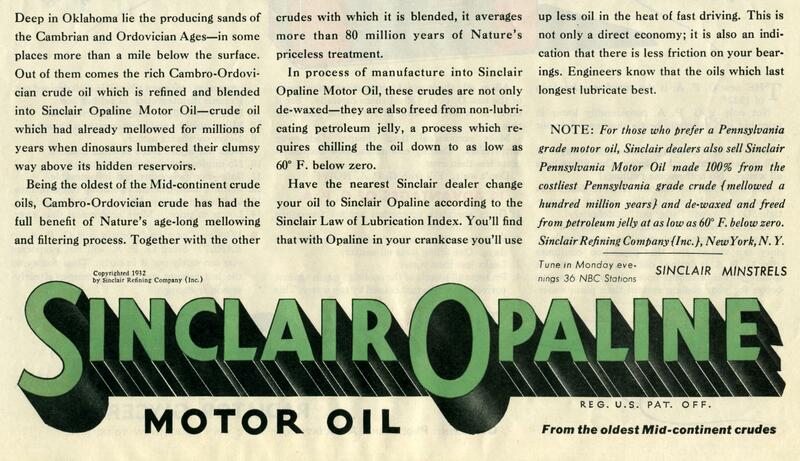 After a wild romp in the cretaceous, the last page left me with more confusion than conclusion. 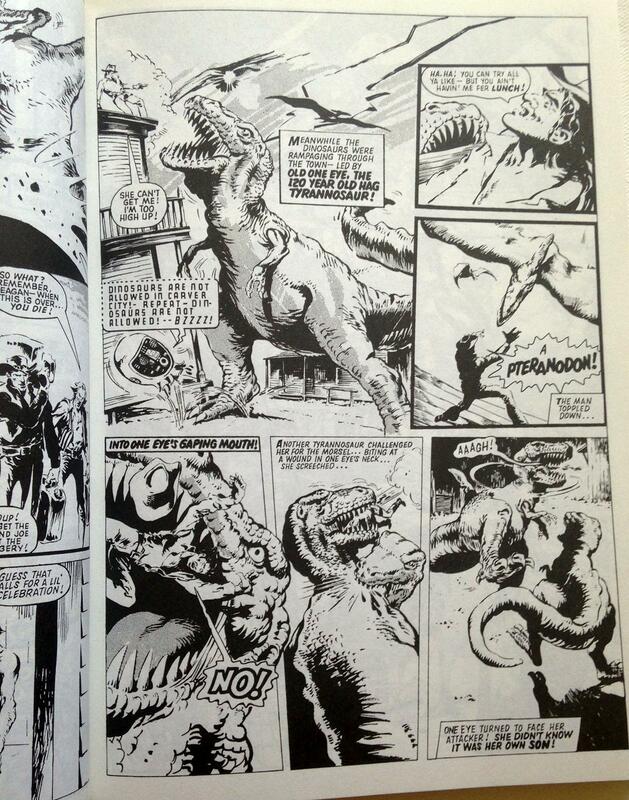 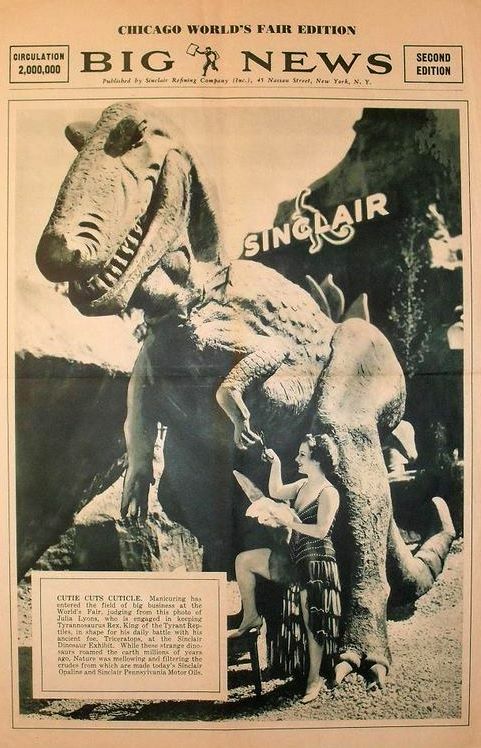 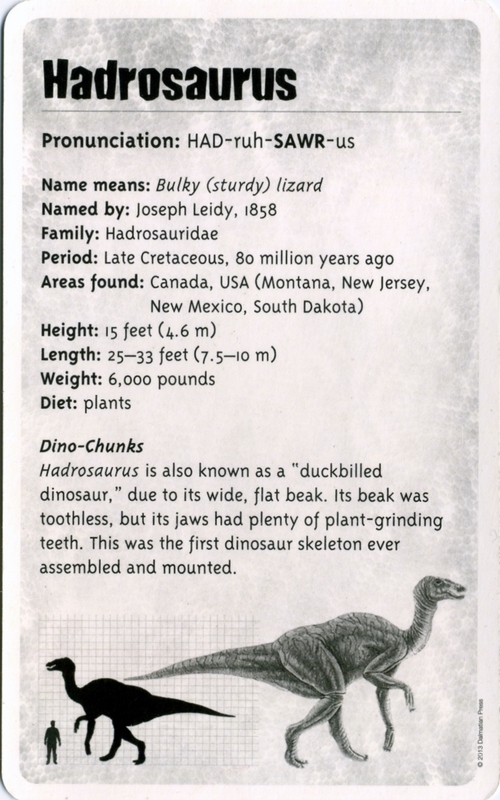 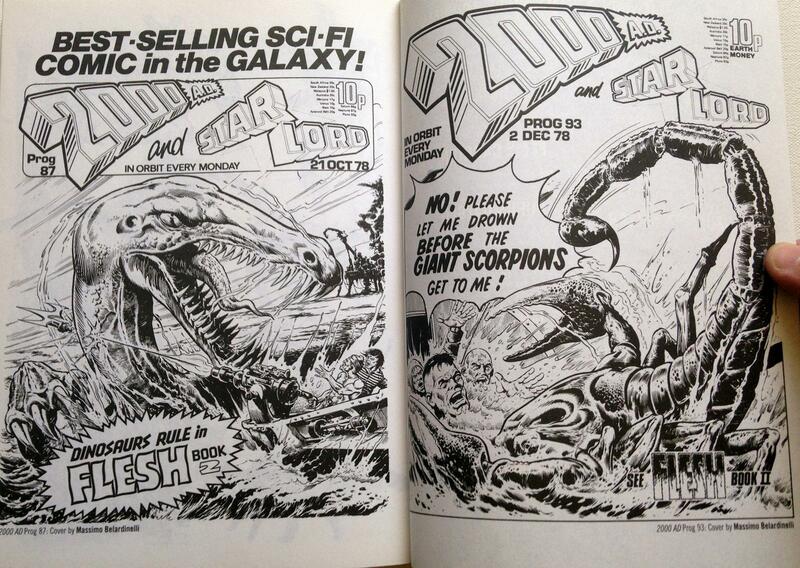 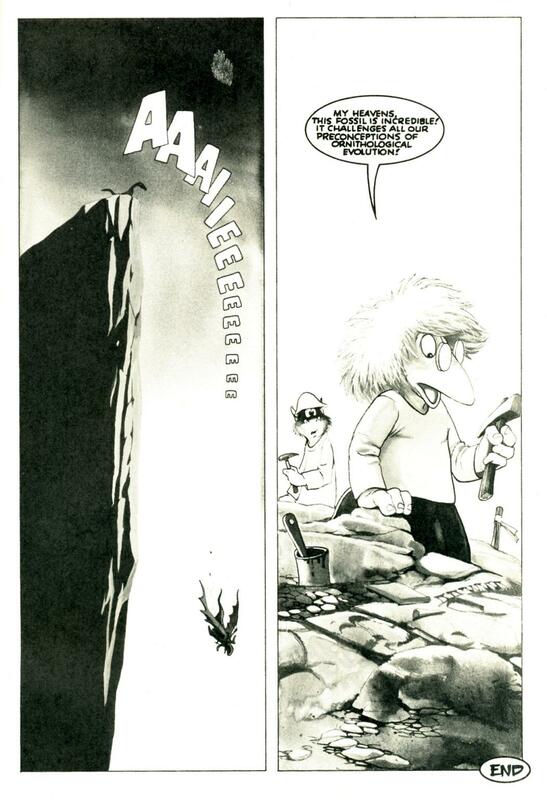 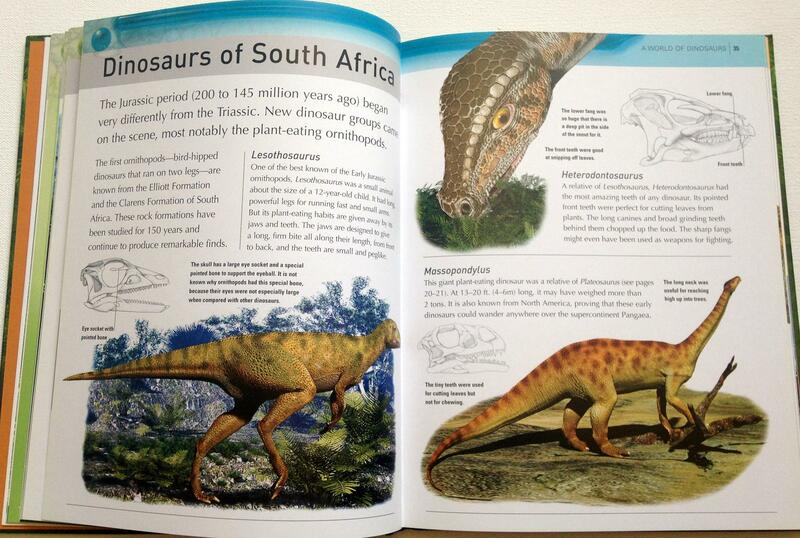 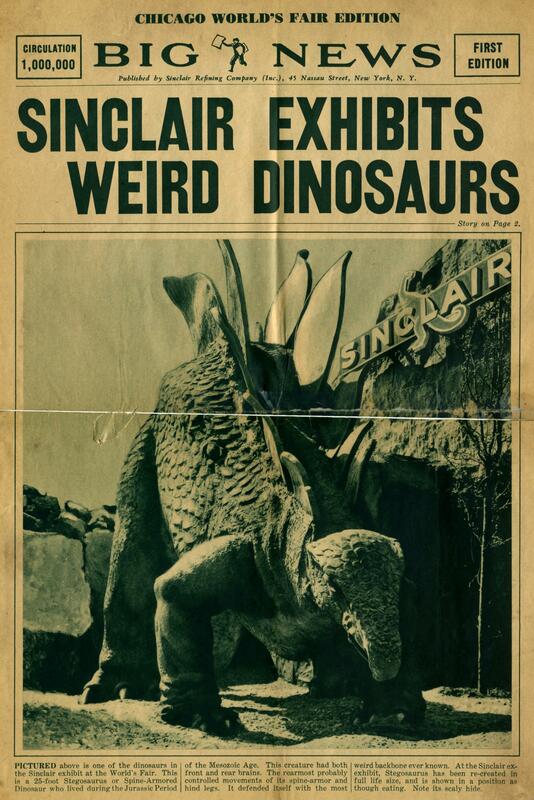 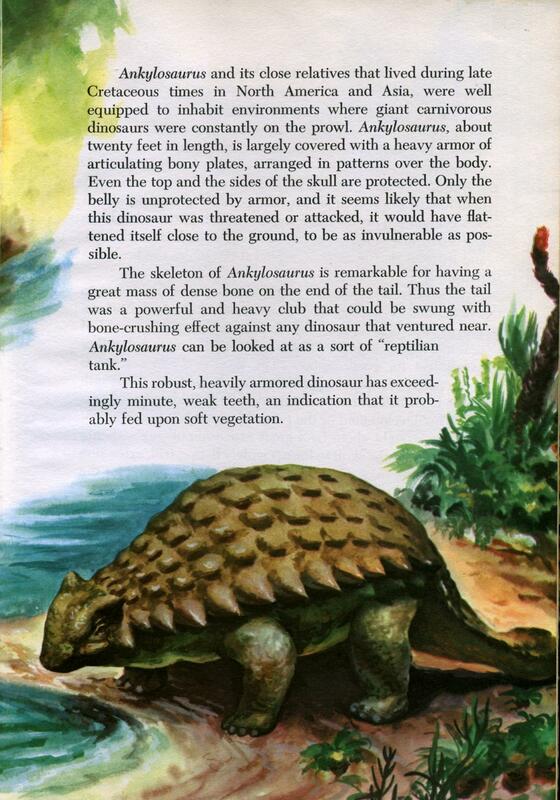 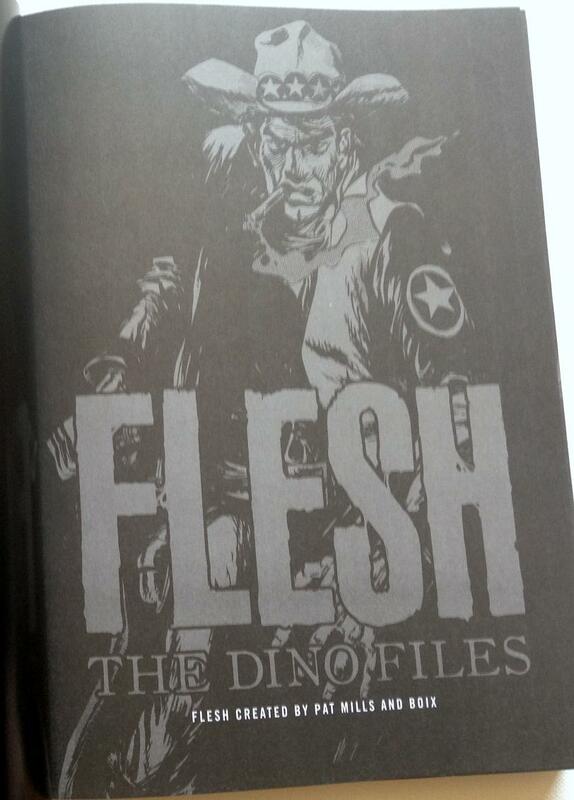 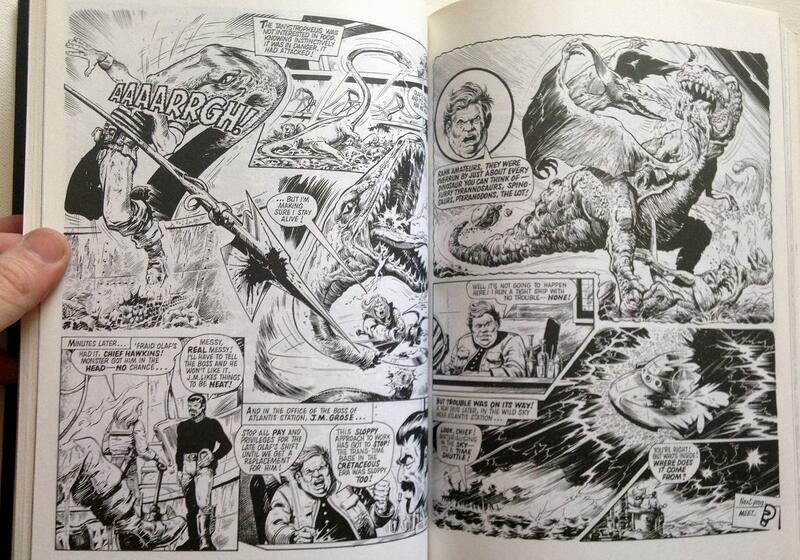 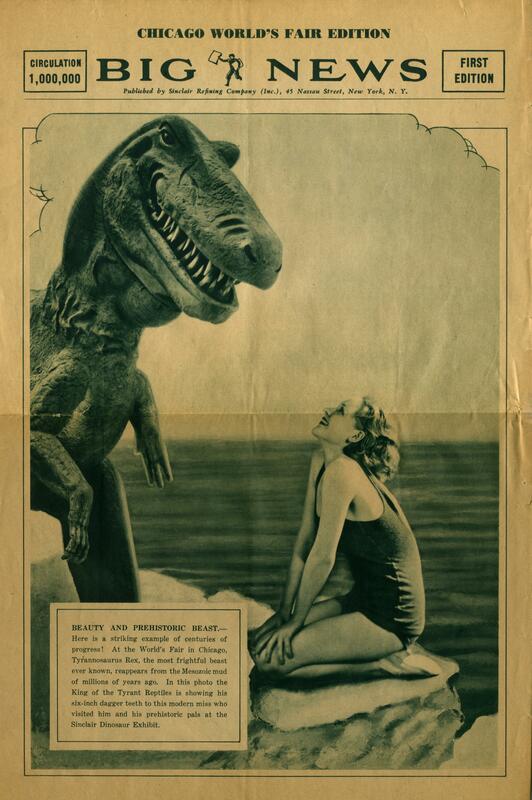 None of that stopped me from enjoying this adventurous addition to my library of dinosaur books and comics. 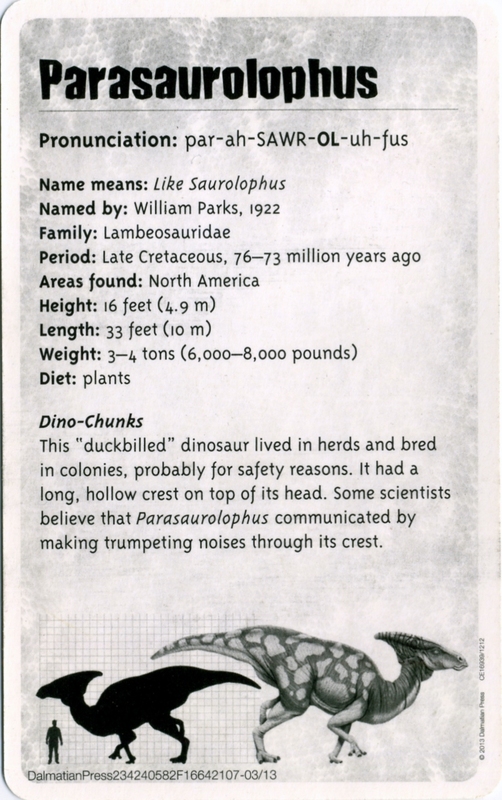 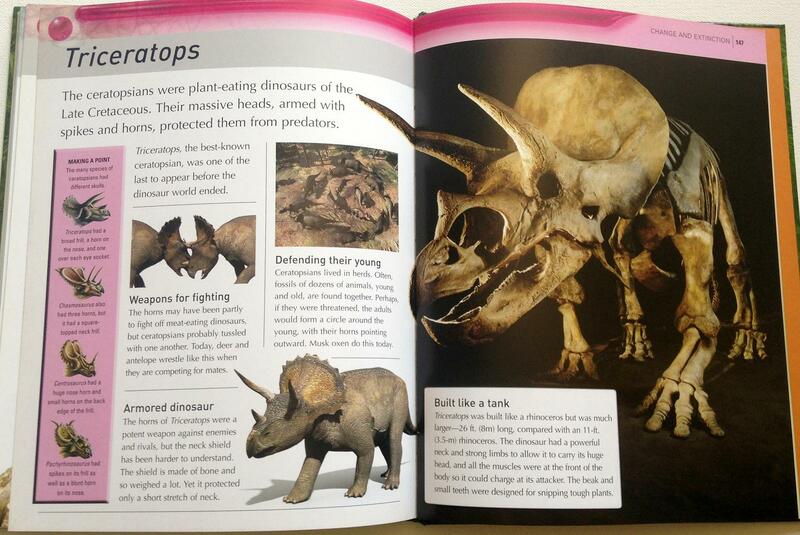 T. Rex Generations is a fun read and a joy to look at. 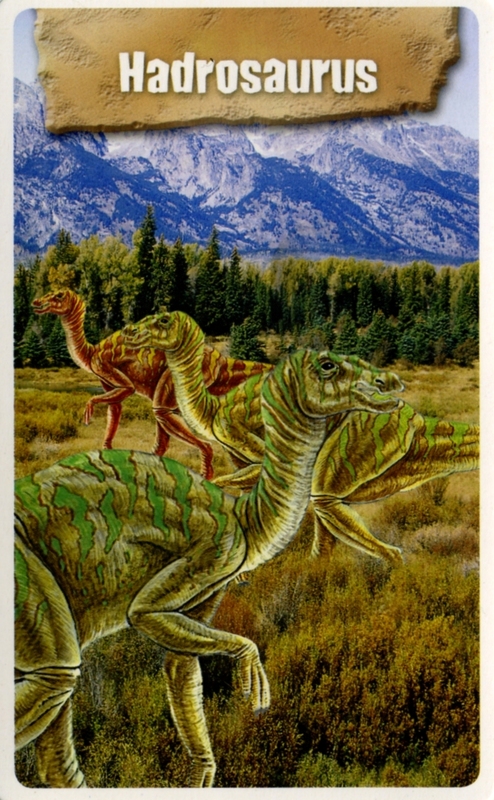 The full-page and two-page illustrations of the rexes and dakotaraptor, edmontosaurus, and ankylosaurus would make great prints or posters. 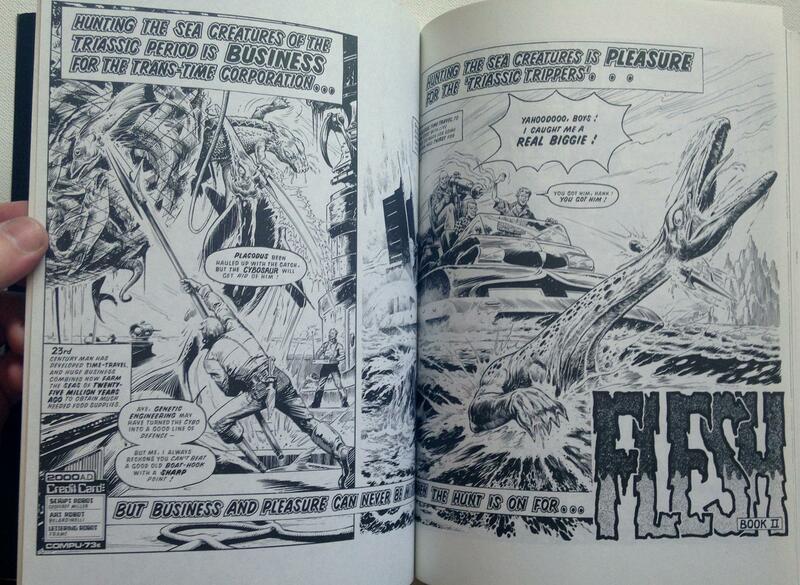 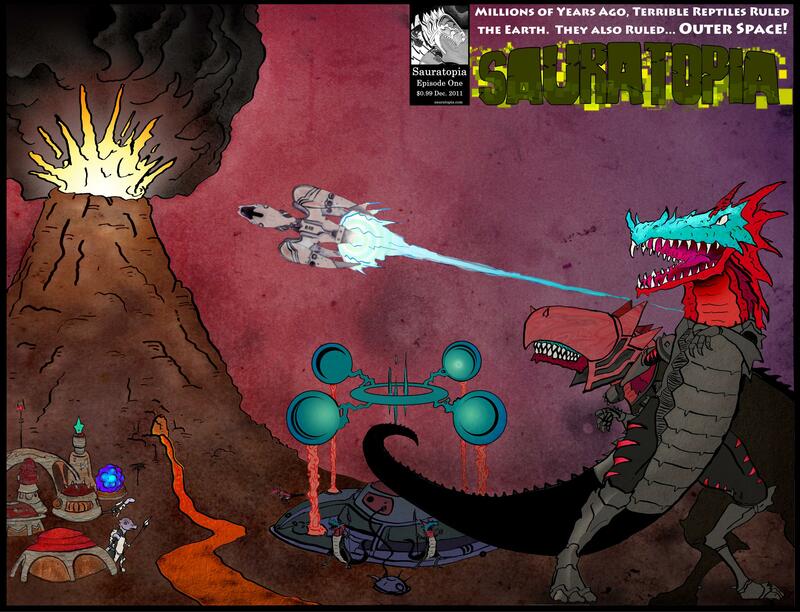 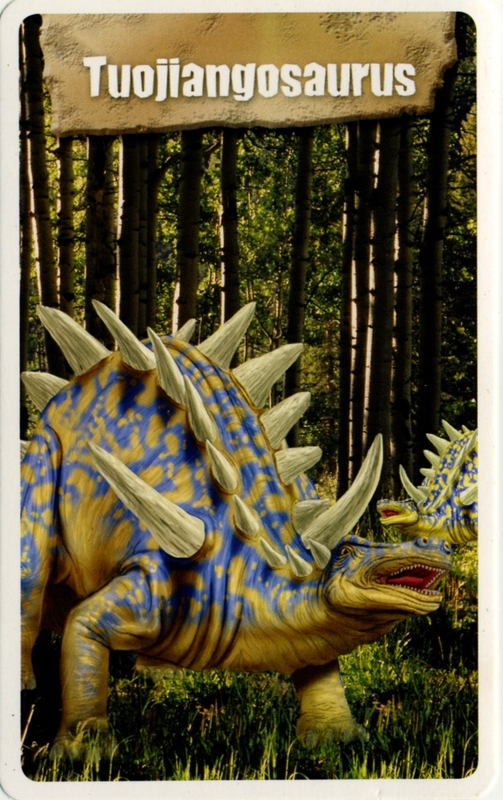 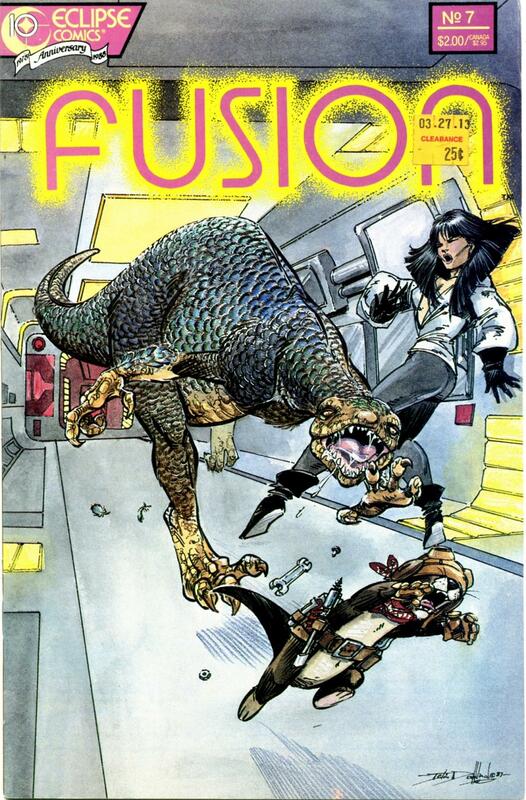 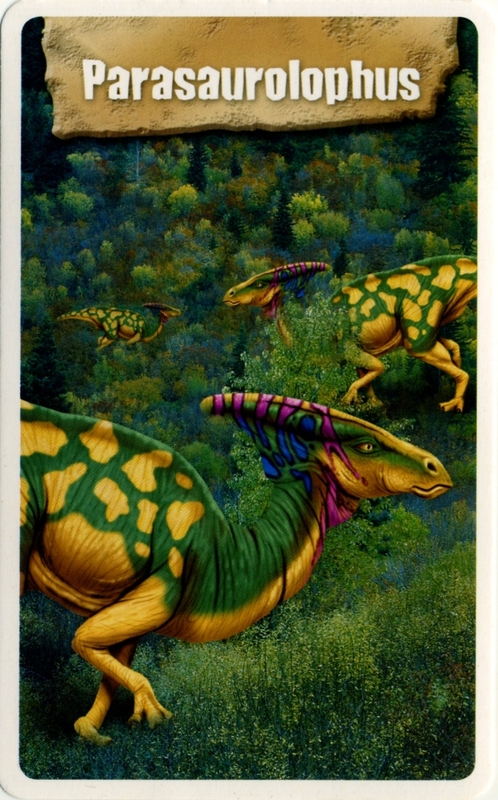 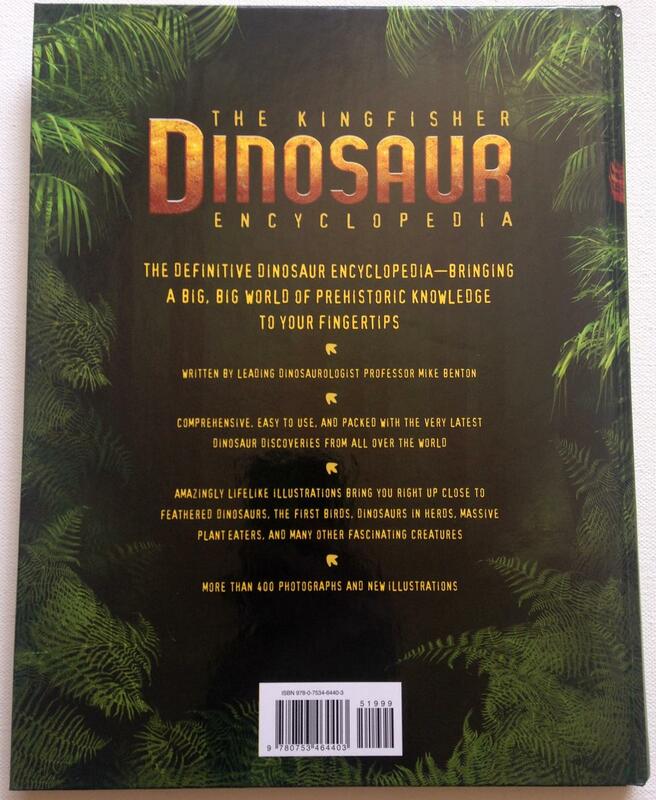 Get some dinosaur in your new year at Ted Rechlin’s store or on Amazon! 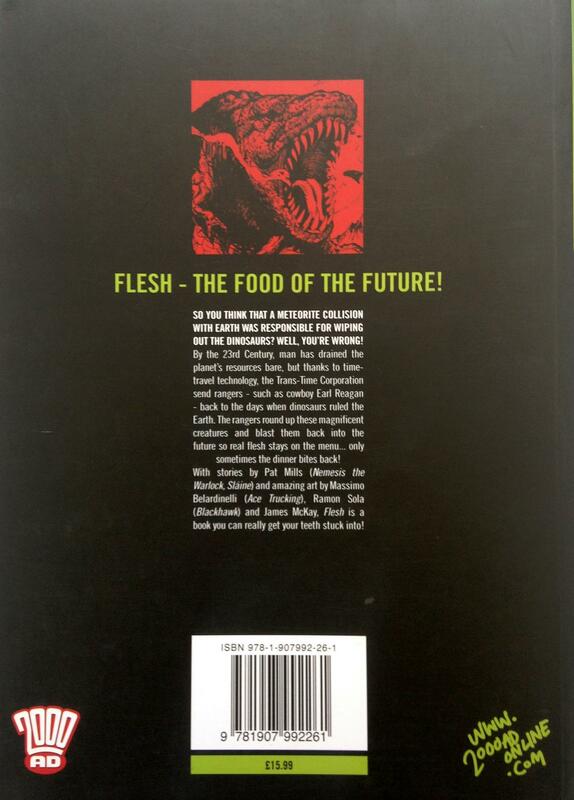 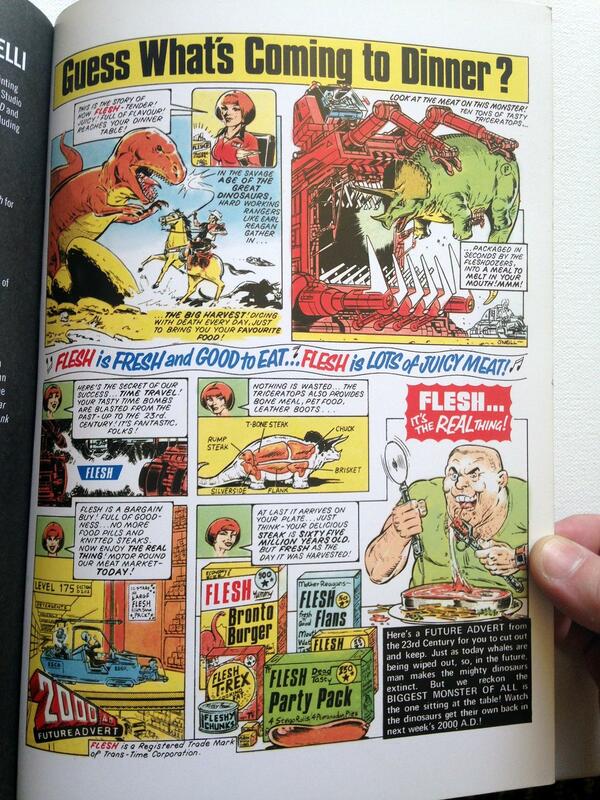 Big thanks to Smith Publicity for the review copy of T. Rex Generations, and to Comicon.com for the images in this post. 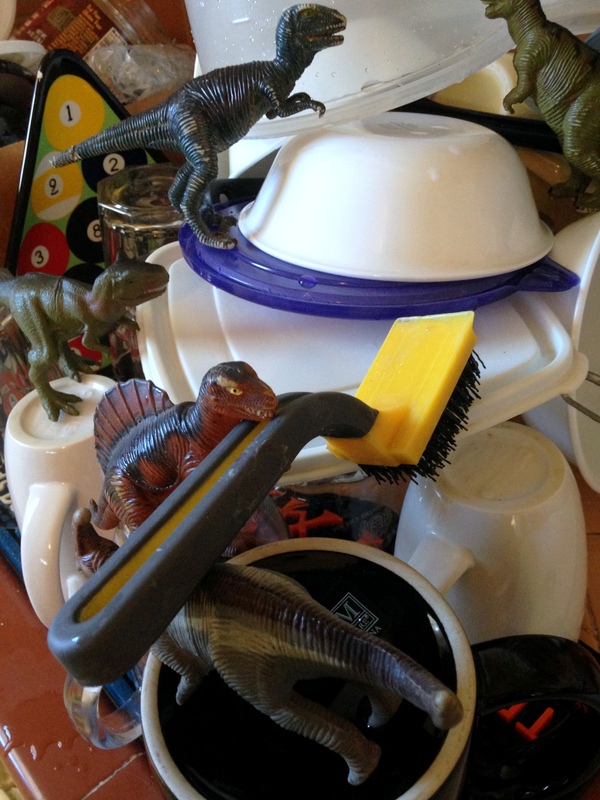 We woke up the other morning to find dinosaurs hard at work, scrubbing and stacking the dishes. 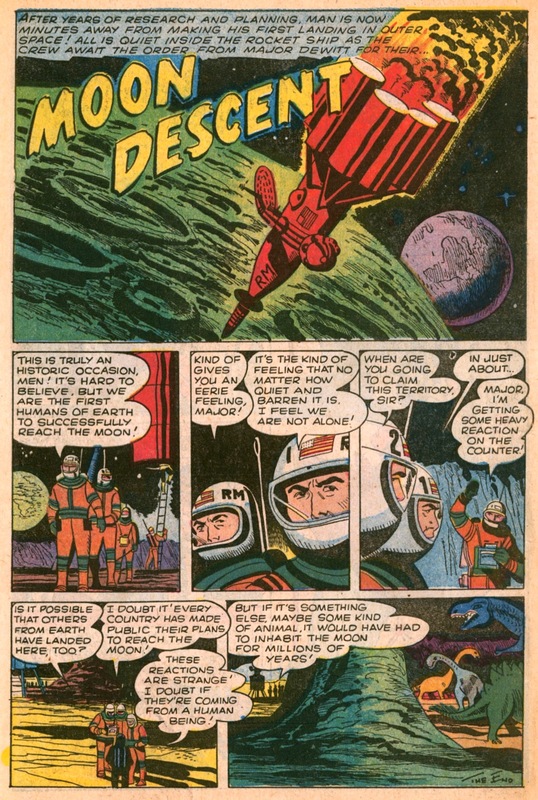 Alarming Tales 6: Moon Descent! 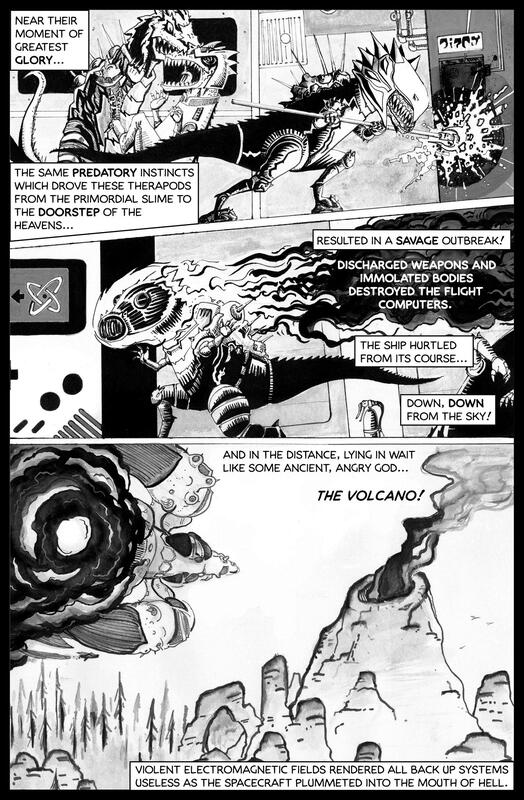 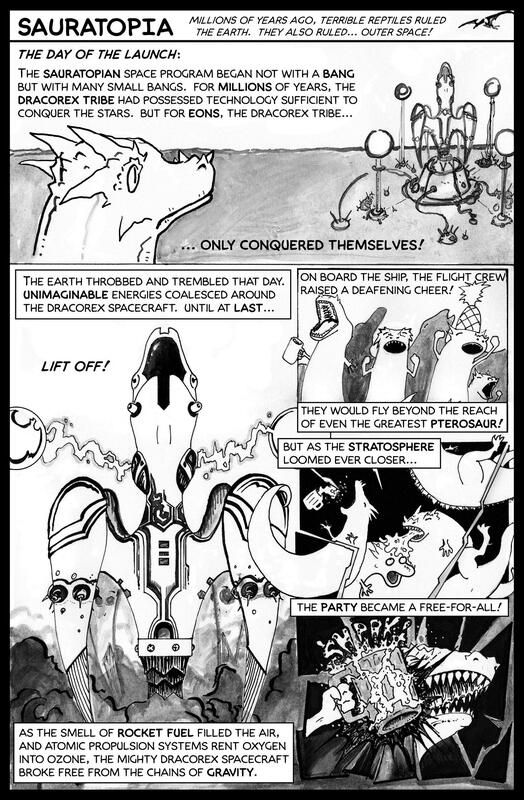 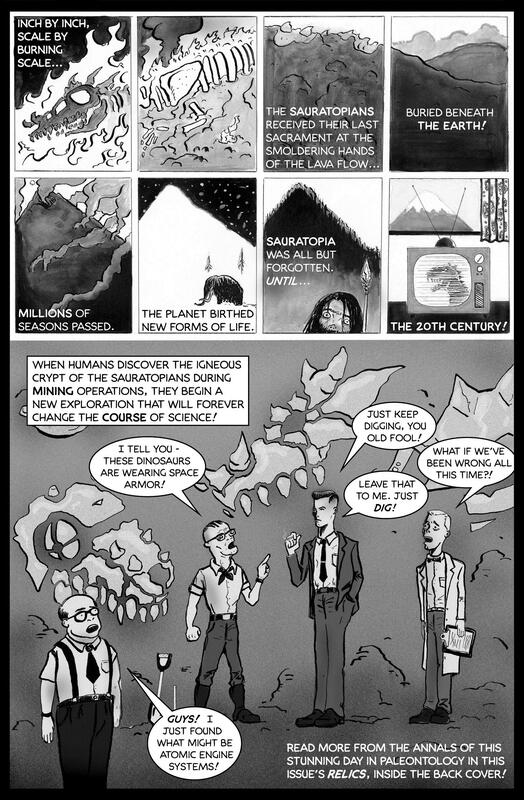 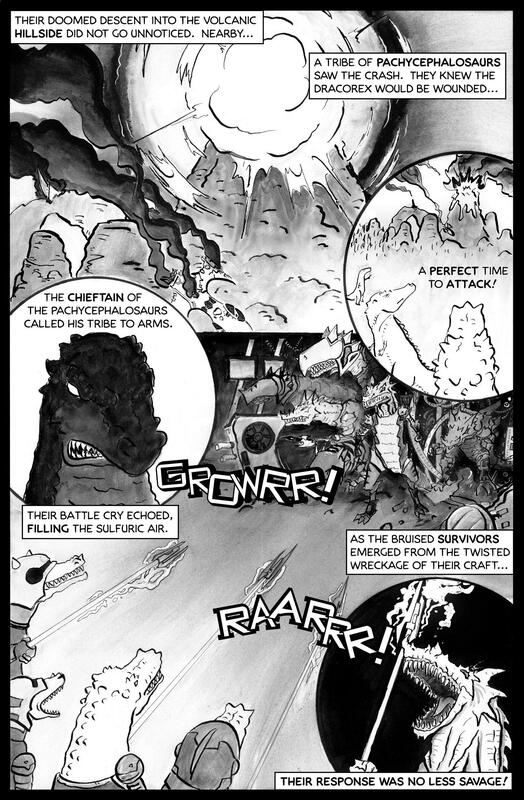 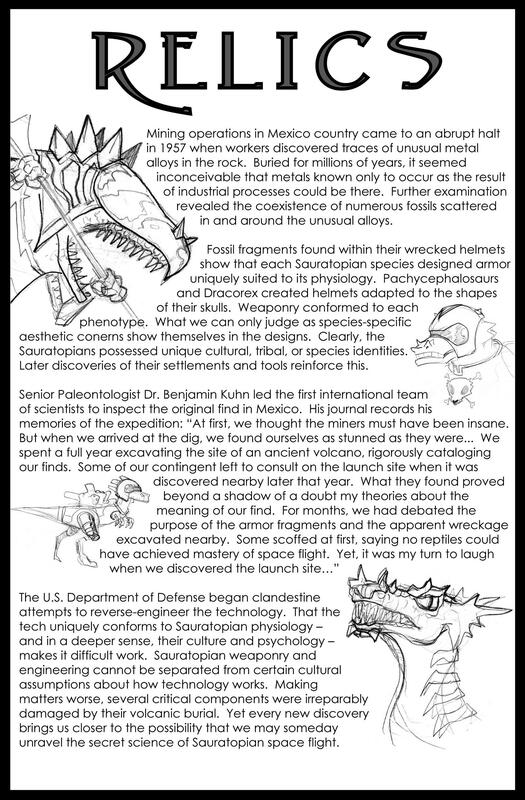 This one page story from Alarming Tales showcases two of our favorite things: going to the moon, and dinosaurs! 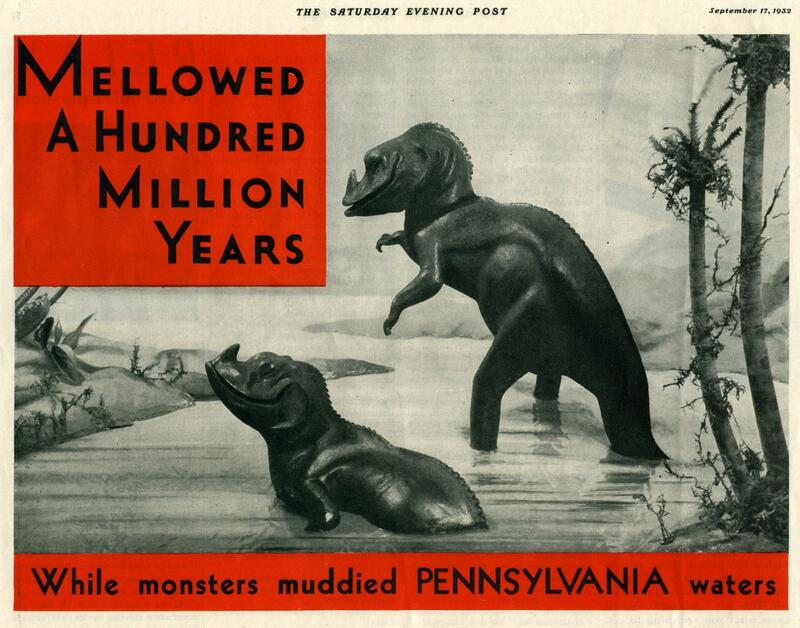 We’re not really sure who gets the credit for this, but feel free to enlighten us. 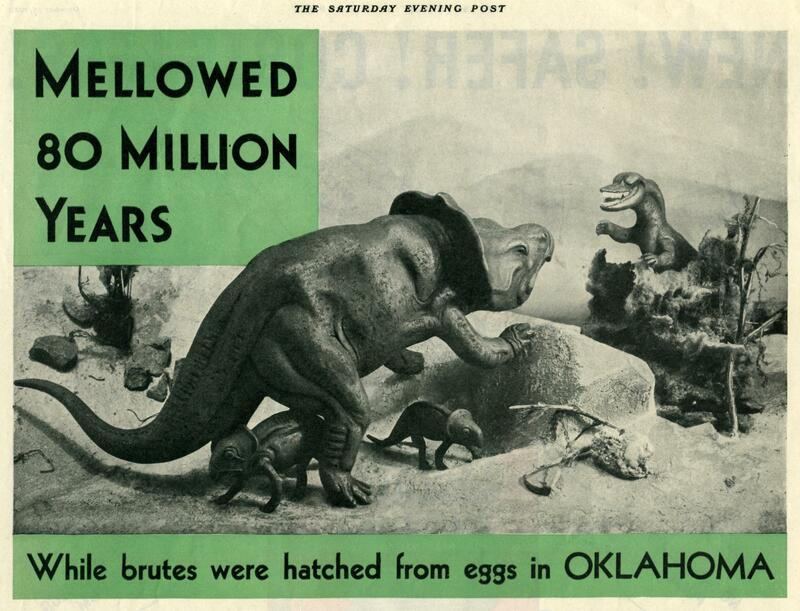 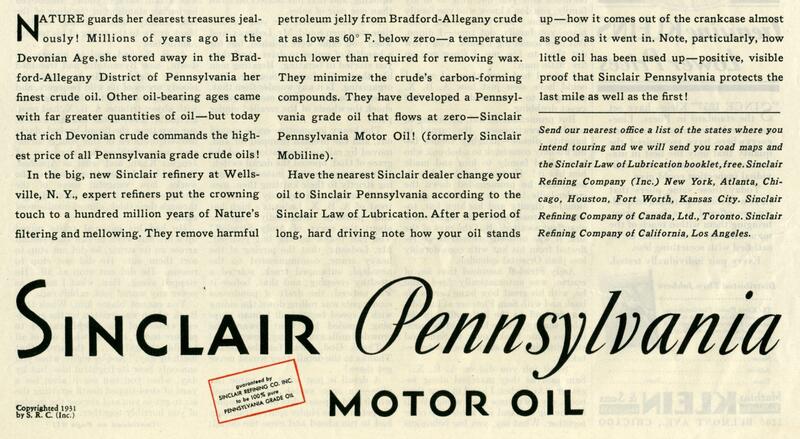 – From Alarming Tales #6; Harvey, 1958.